In the desert in July, when you hear the thunder boom and the skies start pouring rain, it harkens one back to that feeling of being a little kid on Christmas Eve, waiting for Santa Clause (or your magical parents) to do their thing with the presents in the night, and you finally fall asleep . . .
It’s that same delicious feeling in the air that I get when it rains here during the long, long desert summer. What a beautiful thing it would be to dance in it. Picture that for a moment, can you feel it? Tumbleweeds on the railroad. 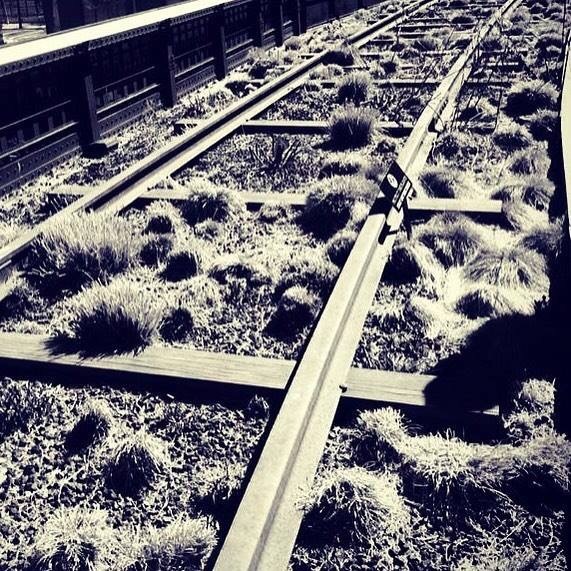 The above story is from this afternoon’s rain in the desert, though surprisingly i took this picture in NYC up on the highline a few Springtime’s ago.